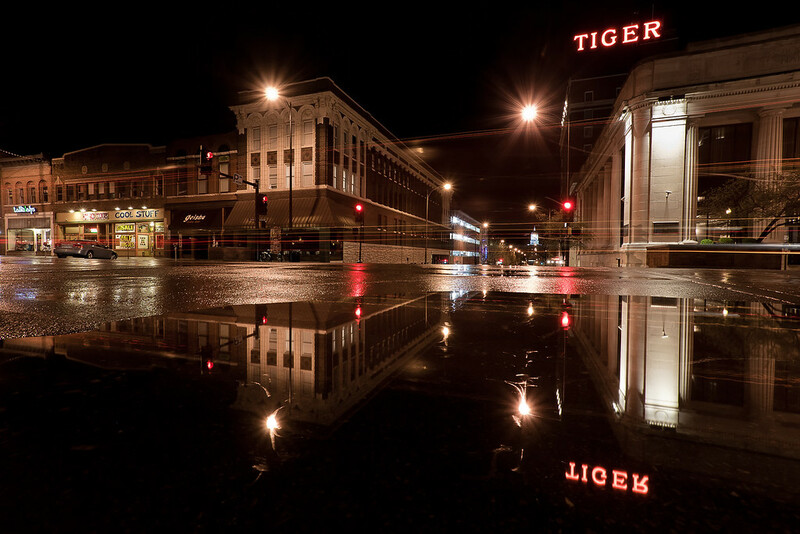 It was raining off and on all day so I decided early in the evening that I would go back downtown late at night and redo this reflection shot looking down 8th street towards the historic Tiger Hotel. I love to look South down 8th street night or day, rain or shine. It has a view of the Tiger Hotel, and the street dead ends right in front of the columns and Jesse Hall, the centerpiece of the University of Missouri campus. I discovered this reflection a week and a half ago and shared this photo. I was unhappy with that photo because my composition had the TIGER reflection slightly cut off. So I had to go back for a redo. Once I find a great view I like to revisit it time and time again until I perfect the composition. This one is still a work in progress. This is a single 30 second exposure. I noticed a semi-truck coming up Broadway so I waited for it to chug up the hill before I started my exposure. I took several, some with no light trails and some with bright white ones, but I liked this one best. 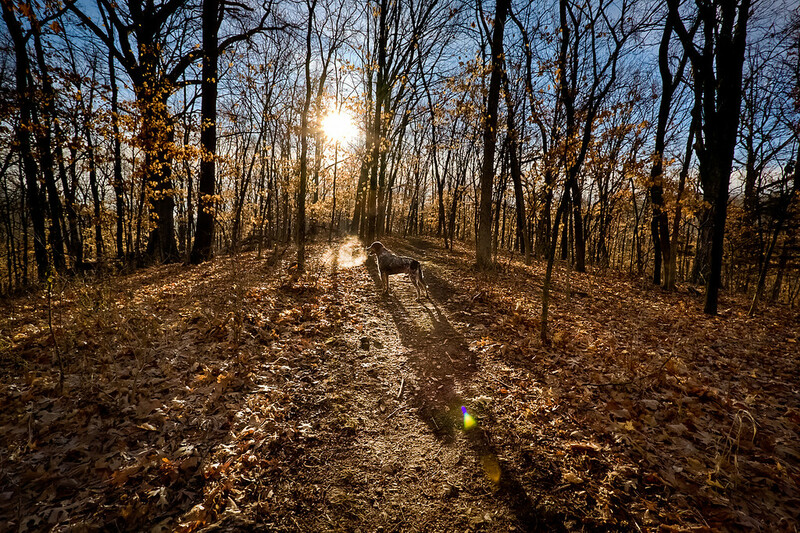 I took the dogs for a brief run at Grindstone Nature Area. I was running late, so I rushed through our normal hike without taking any breaks until we got to Mini-Rock Falls. When I got there I had exactly 10 minutes before I had to leave. I made two photos worthy of sharing during those 10 minutes, including this one. Photography never ceases to surprise me. Sometimes I shoot for two hours and end up with nothing. Other times I shoot for 10 minutes and get two gems. For example, the other night I shot for two hours trying to capture lightning as a storm blew South of Columbia, and came home with nothing. This is a single 1/2 second exposure. I used a circular polarizer to cut the glare off of the water and allow the colors and textures of the rocks to shine through. I was surprised how dreamy the water looks at this shutter speed. I generally like a longer exposure, but in this case the water was moving fast enough and I was close enough to the action to get a nice blurring effect. I checked the image on my LCD screen and saw I had good motion blur, so I didn't need to get out my neutral density filter and use a longer exposure. It was a good thing too because I was in a hurry! CreativeLIVE is live today. The workshop is "Lightroom Fundamentals" with Laura Shoe. You can watch live in high resolution for free here (and low resolution here). Hinkson Creek is slowly receding and I'm able to get just little further out into the creek without getting wet. But after seeing this view the other day now I'm determined to bring my sandals and get in the frigid water for the ultimate Mini-Creek falls shot! 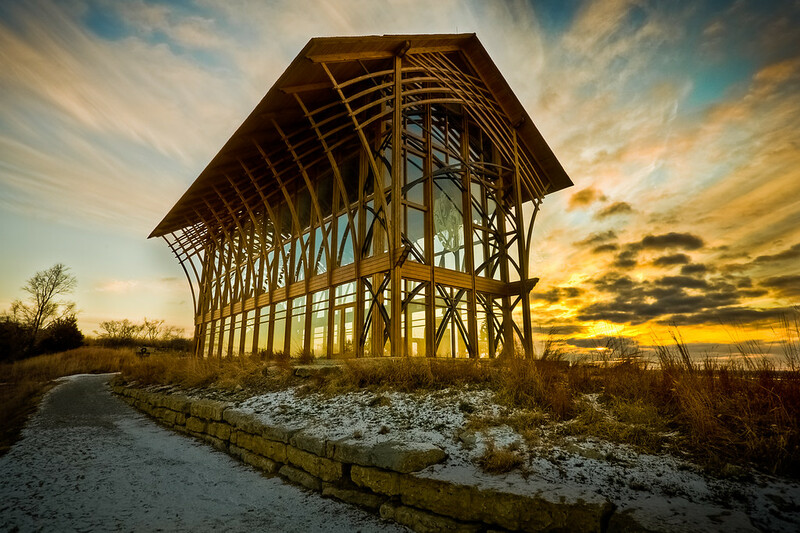 I should see if the Columbia MO parks department wants to use some of these photos to promote Grindstone Nature Area. Maybe I should make a Grindstone calendar or iphone app or something? This is a five exposure HDR. The single exposures range from 30 seconds to 2 seconds in one stop increments. The light on the trees in the background and the long exposure water really make this photo for me. 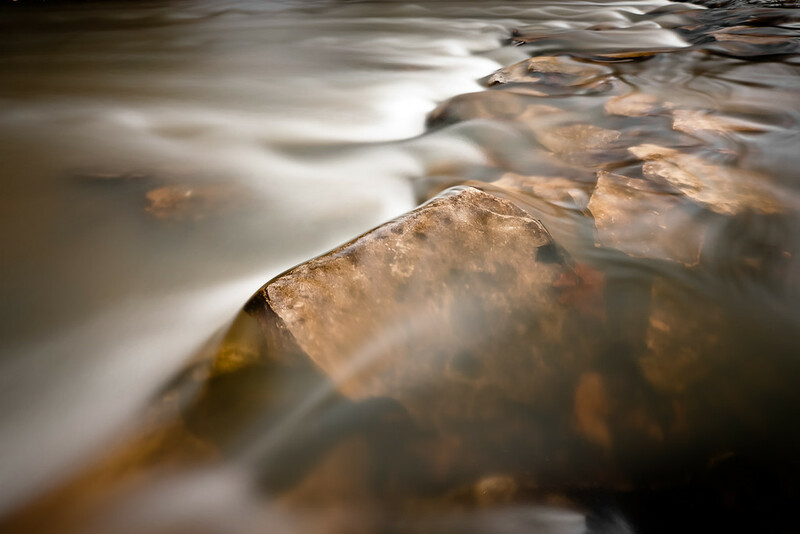 I'm never satisfied with my composition, but I think getting in the water will yield much stronger compositions. The slow moving water behind Mini-Rock falls created some cool patterns I'll have to try and capture better in the future. 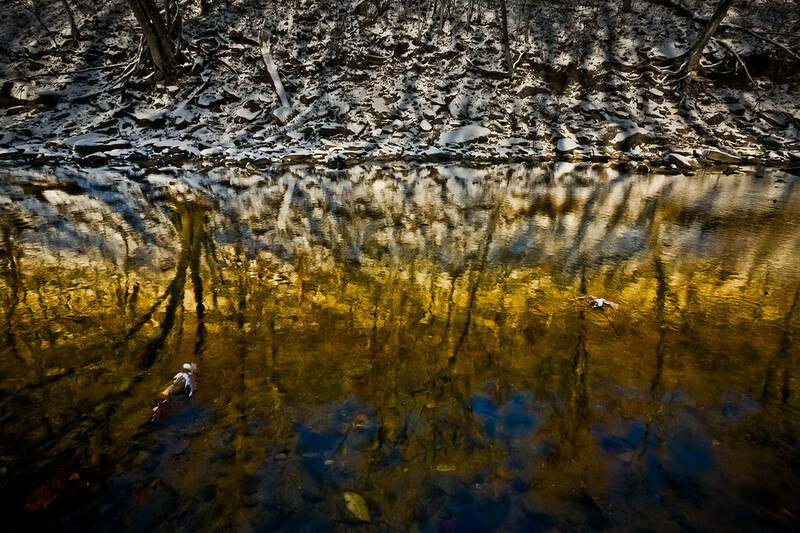 This reflecting pool caught my eye as Nini and I walked with the dogs along Hinkson Creek in Grindstone Nature Area yesterday. 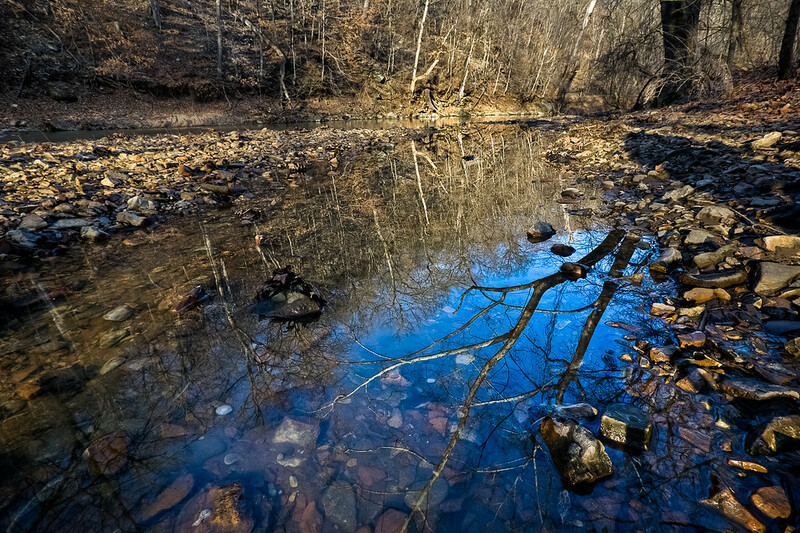 There are several nice reflection pools along the creek now that the high water has started to recede. I tried to get Big Red to pose in the water for me with a big reflection, but there were too many squirrels in the area. Maybe next time. This is a six exposure HDR. I had originally set up my tripod about 10 feet in front of where this one was taken, but noticed the branch reflection and had to move back to place it in the frame a little better. I used a circular polarizer to increase the glare on the water, bringing out the reflections and the blue sky. When we were on our way to the park I noticed we would have a boring cloudless blue sky and I thought it would not be a very productive outing. I'll have to remember to look for reflections the next time I see a cloudless sky. 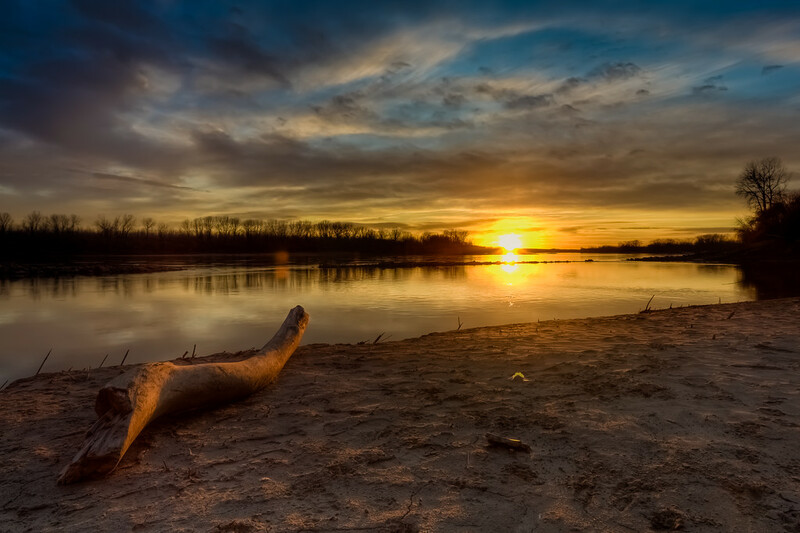 The final of three sunset photos from our trip to the "best beach in Missouri" on the banks of the Missouri River. I usually plan to stay for an hour after sundown and take photos during the blue hour when the light goes cold and blue. I really love the way the camera catches that deep blue light. This photo was taken just after sundown. See my previous posts from the best beach in Missouri here and here. 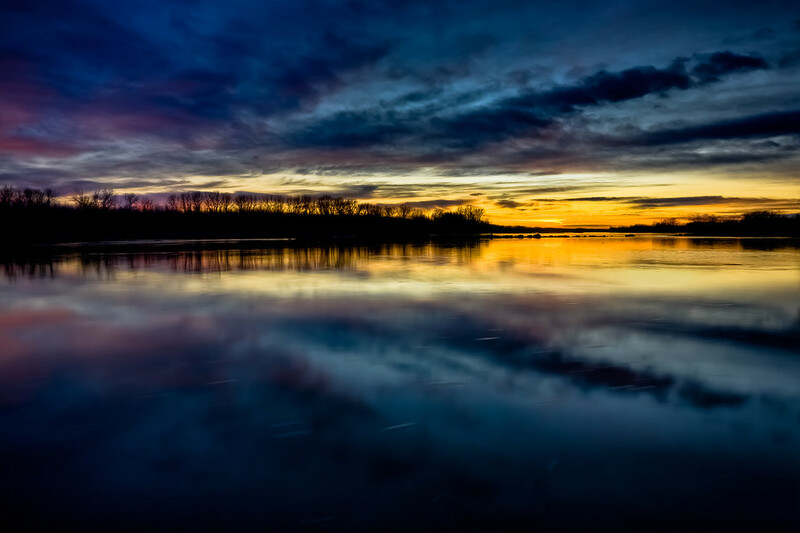 This is a five-exposure HDR and the exposures range from .5 to 8 seconds in one-stop increments. After the sun had set I was still set up facing directly toward the sunset. But Nini pointed out that the Southeastern sky was glowing purple! I quickly recomposed to get some of the purple light in the frame. It was gone before I could get off six exposures, so I was left with five to work with! The boys and I took a quick hike at Grindstone Nature Area. The sun had already went down and it was getting cold, but I decided to take the high ridge trail out of the park anyway. 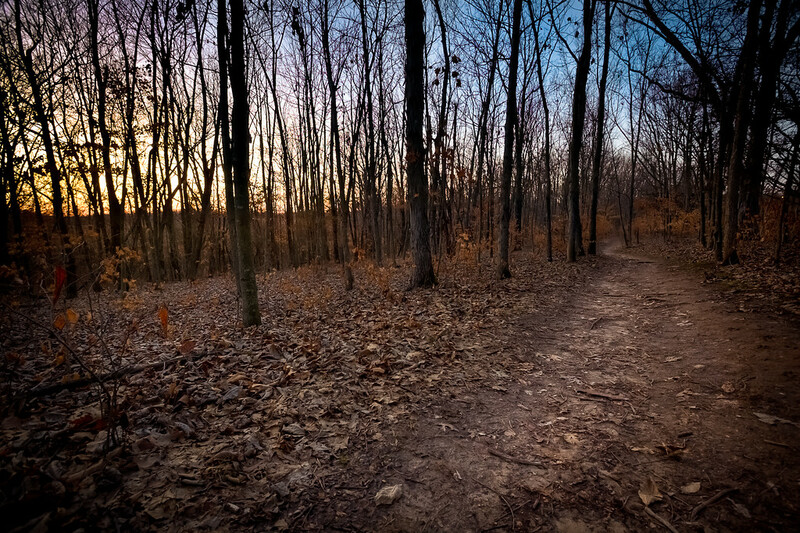 I was treated to this lovely view of the dusk sky along the trail. This is a six exposure HDR. 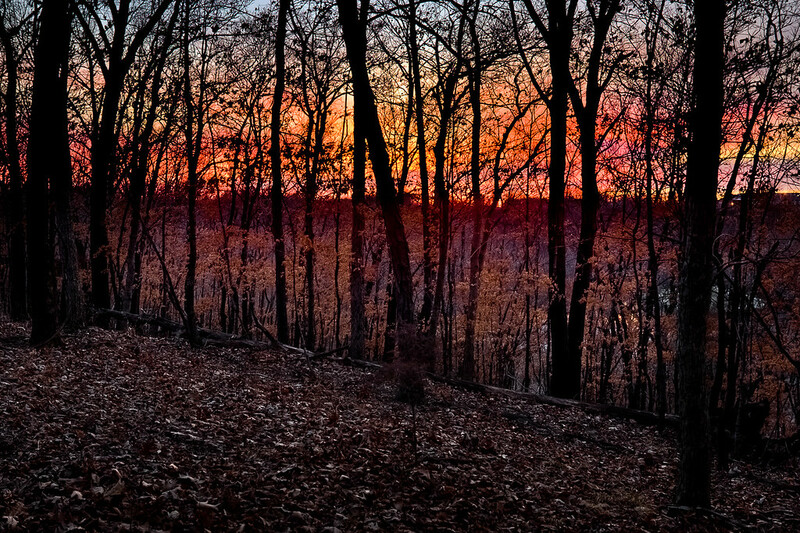 This is a six-exposure HDR. Despite an awesome view of the sunset, I struggled for a long while to find a composition I liked. But we arrived 45 minutes before sunset and I had plenty of time to try out different compositions and ultimately settle in on a few that I liked. To get this photo I was standing on rock that had two inches of water flowing over it. My hiking boots are awesome so my feet stayed totally dry. Composing photos like this can be physically demanding. Trying to balance in the middle of the creek, on slippery rocks, hunched over for the low perspective, holding your breath so your glasses don't fog, can really wear on your body. Once I get everything set and finally stand upright and take a deep breath, I usually experience a moment of dizziness from the blood rushing back to my head! It would be a lot easier if I just got in the water. Right now it's a little cold though and in the summer we've seen water moccasins swimming in this area of Grindstone Nature Area. I prefer cold water over snakes I guess, so maybe I'll get some waders and really get serious with this creek. This is a single exposure. I used a circular polarizer reduce the glare and allow the colors to shine through, and a six stop neutral density filter to allow for a long 30 second exposure. 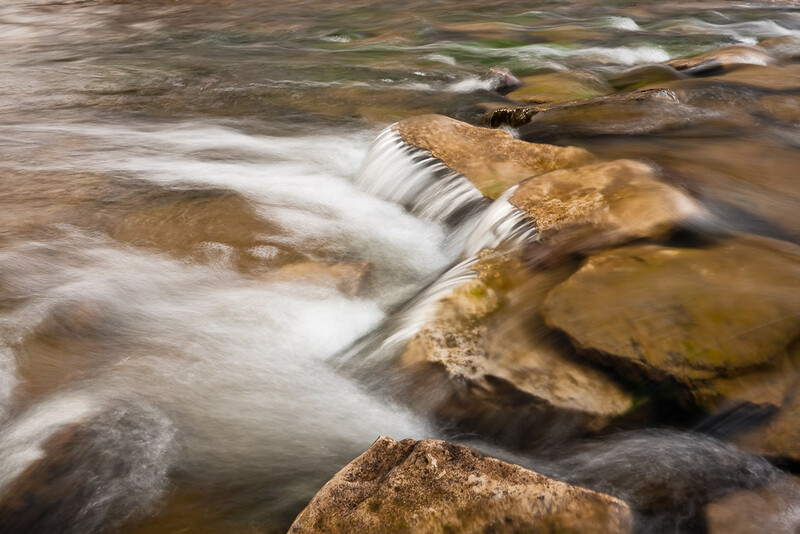 I like to take long exposures on the creeks I come across in town, getting lots of practice for PHOTO ADVENTURES to come. 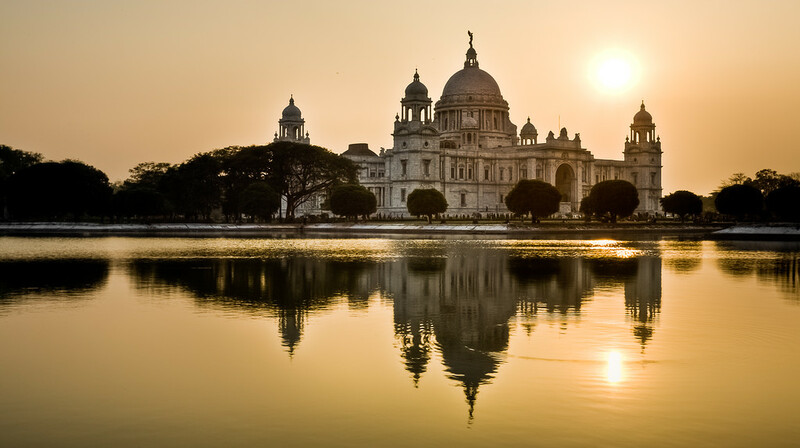 I have shared a few HDR photos of Victoria Memorial in the past (see previous two posts), but this is the first single exposure I have shared. WHAT DO YOU THINK? 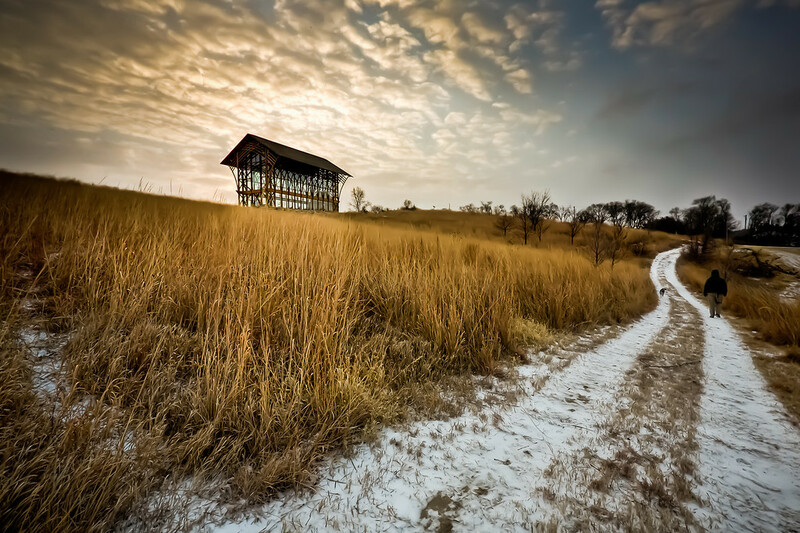 DO YOU PREFER THE HDR OR SINGLE EXPOSURE? I'm amazed at how quickly my processing techniques evolve. I always think my most newly processed photos look the best, and any time I re-process something I usually like the new version better than the old. In some ways processing is similar to writing, and the first version you make is just a first draft, which gets better and better with each revision. Can you spot the sun in this sunrise? Continuing with the story from my previous post, this photo was taken with Nini standing directly to the left of the camera so that it could not be seen by the guards at the main entrance and in the middle of the grounds. By the time the sun was this high more than 500 morning walkers were getting their exercise walking around the huge park within the gates of the Victoria Memorial. Some were meditating, others playing badminton or frisbee, and there were several workout groups of mostly men doing stretches, sit ups, push ups and jumping jacks. It was an older crowd, the average age was probably around 45 or 50. It was very cool to see so many people using the beautiful park early in the morning. Even with all of the walkers the park is so big that it was not crowded at all. In fact, I don't think you can spot any people in this photo, even in Original size. In comparison, the crowd at sunset was massive, check out the crowd in larger sizes of this photo. 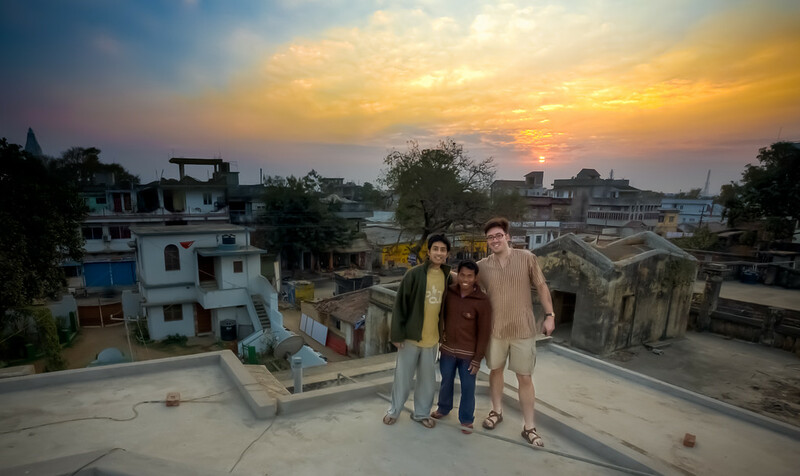 We returned from India on the evening of January 16th, and by 7PM I was fast asleep. But I awoke at 5:30AM the next morning and could not go back to sleep. So I made myself some steak and eggs from a leftover steak from the dinner I slept through the night before. Then I woke up dad around 6:30, picked up my boy Big Red, and headed to Gretna to make more photos of the Holy Family Shrine. Since it was so early in the morning I let Big Red run with me, but don't tell anyone. For more information on the Holy Family Shrine see my older post here. The sunrise was pretty lame, the sun peaked out for about five minutes before being engulfed in clouds. Also lame: ISO 640! I made an amateur mistake and forgot to reduce my ISO after my previous shoot, which was indoors in very low light. Whoops! As a result, this photo required more noise reduction than I normally like. This is a six exposure HDR. 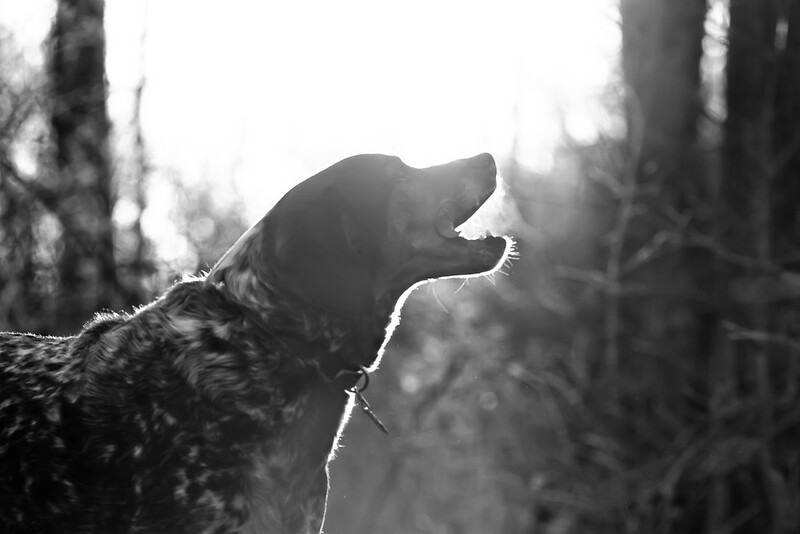 The sky started to combust as Nini and I were hiking with the dogs along the cliffs overlooking Grindstone Nature Area. I thought we'd have a view of the sunset from our vantage on the cliffs, but we were in a new area and I was totally wrong. I headed off-trail toward the colors and ultimately found this clearing in the woods. It wasn't the best spot for photographing the sunset but this was one of the best sunsets I can recall in Columbia and it was amazing to watch the colors change and ultimately fade away. This is a six exposure HDR. With a single exposure I was able to capture the gorgeous colors of the sky, but everything else in the frame was completely black. But when I was standing there, witnessing the sunset, I could see beautifully colored light washing over the three layers of leaves: in the distance, on the low brush and in the foreground. Using multiple exposures I was able to create a more accurate, yet still far from perfect, match with the reality that unfolded in front of my eyes. HDR photography doesn't always work out this way, and can be used to create unrealistic looking photos as well, but in this case I think it helped a lot. Big Red sitting on guard in the sun at the end of our bed. 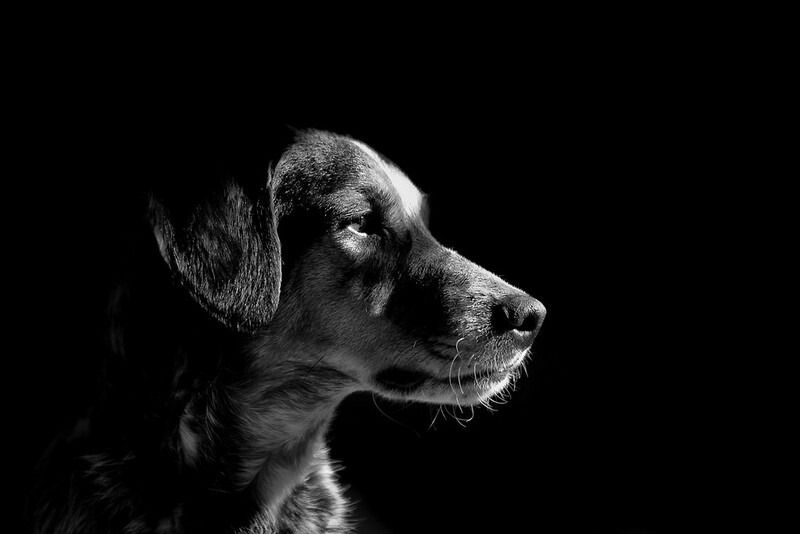 Isn't he a handsome boy? We have lots of nicknames for Big Red and not all of them are very flattering. But in this photo I think he resembles "Angel Boy," the nickname I use most when he's behaving like a perfect angel (very rarely used nickname). And the light was so beautiful on him that it could have been shining down from heaven directly. Fitting for an Angel Boy. I really like to use natural light. In this case I wish I would have turned up the ISO a stop or two and increased my shutter speed so I could get a sharper image handheld at this range. But I'm quite happy with this exposure. I have not converted many photos to black and white in recent memory and this is one of the first I've tried using Lightroom3. I was very lucky to wake up early and witness a stunning sunrise during the low tide at Beach #5, also known as Govind Nagar Beach. It was one of the most beautiful sunrises I can remember seeing. I highly recommend the Symphony Palms resort which is as close to the beach as you can get without a tent. There is a constant cool breeze blowing through shady palms; a nice retreat from the 80 degree temps and hot sun. In addition, the restaurant at Symphony Palms is excellent, and serves the coldest beer in the Andamans. Beach #5 offers stunning blue and green colors due to the shallow water (see previous posts). During high tide it is only about five feet deep for the first 100 meters or so, most of which is exposed at low tide. 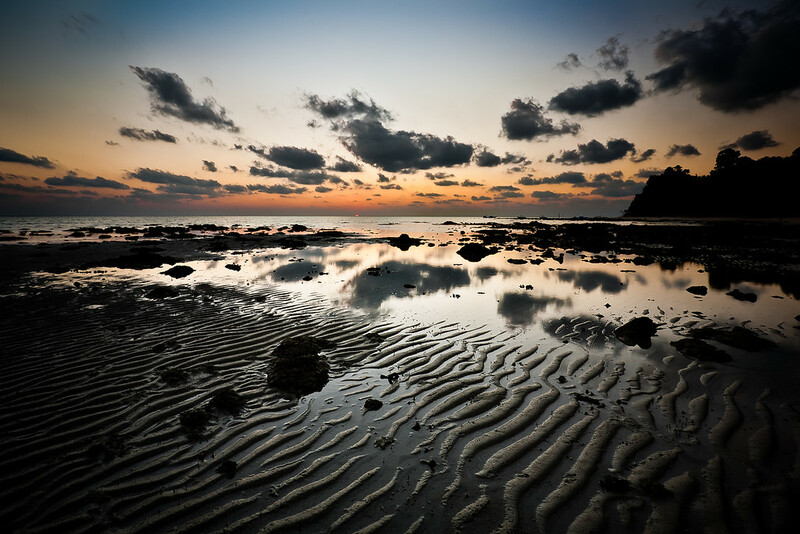 The low tide reveals some excellent rock formations and sand patterns, and creates some nice reflection pools for photographing the sunrise. 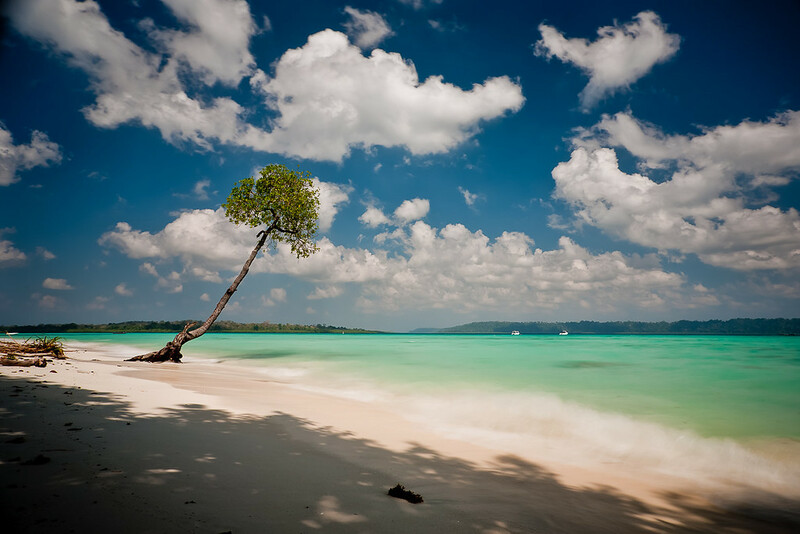 I asked several locals in Port Blair where they had seen the most beautiful scenery in the Andamans, and without fail, every single person said Havelock Island. If you're into beaches, I can't imagine any more beautiful than those on Havelock. 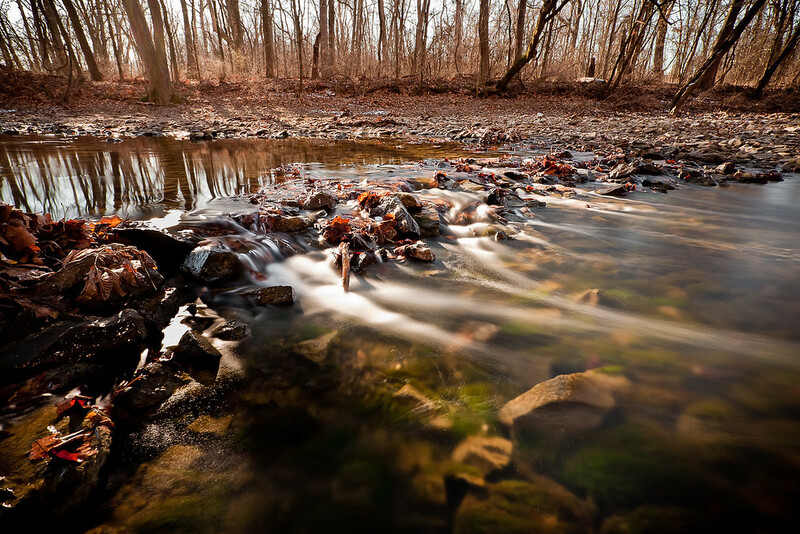 This photo is a single exposure taken with a circular polarizer. On a full frame body such as my 5D a circular polarizer can create extreme light falloff in the corners of the frame, so much so that the very tips of the corners are totally black at wide focal lengths (of course this depends on your camera, focal length and the thickness of your polarizer and other filters). I added some vignette to help it blend in without having to crop too much. 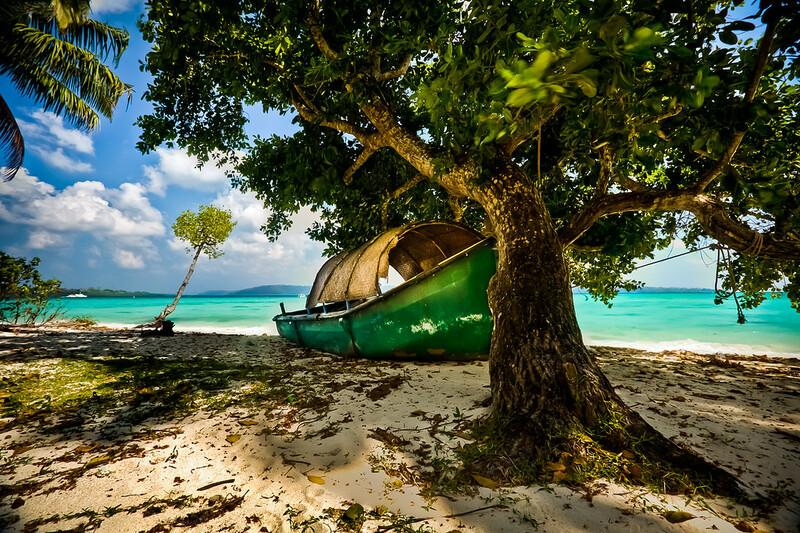 This old boat was tied to the tree for the two days we were on Havelock Island. It doesn't seem to get much use these days, but it sure makes for a great photo op. Any time I had some free time to take photos on the beach I always found myself coming back to this boat. The shallow waters at Beach #5 make for a beautiful mix of blues and greens. See my previous post for more info about Beach #5. 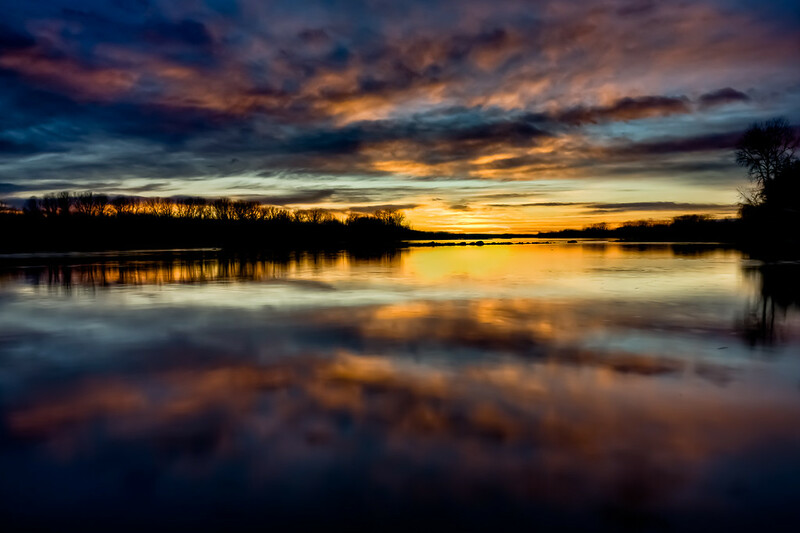 This is a four exposure HDR. This is a case where I really don't see any alternative to HDR given the extreme lighting contrasts that were present at the scene. The water color is accurate. If you visit this beach you'll see for yourself. The bright midday sun doesn't lend itself to long exposures, but I brought my ND filter and circular polarizer so that I could slow things down a bit and capture the soothing motion of the sea. Beach #5 is not the main attraction on Havelock Island, and is usually overshadowed by the far more famous Radhanagar Beach (Beach #7), which is considered one of the best beaches in the world. I would have to agree that Radhanagar Beach is the best for swimming, as the water gets deeper close to the shore, the sea floor is free of rocks, and the beach itself is long and wide, offering plenty of space to find a private spot to hang out for the day or camp overnight on the beach. 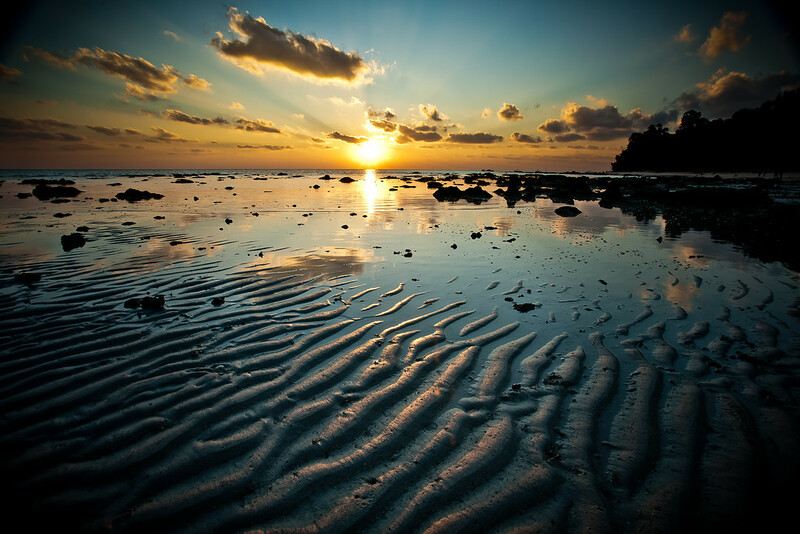 In addition, Radhanagar Beach offers a stunning view of the sunset. But Beach #5 is more ideal for photographers wanting to get a shot of the colorful waters prevalent across all of the Andaman Islands. Two factors make the colors pop at Beach #5. First is the shallow water, which creates the turquoise and green colors for the first 200 meters or so, giving way to the blues of the deeper waters further out. Second, and more importantly, Beach #5 faces Northeast, allowing photographers to shoot away from the sun and preventing the colorful water from being blown out by the sun's harsh reflection. Radhanagar Beach on the other hand, faces West making it difficult to capture it's beautiful green and blue colors except for a few hours early in the morning. So if you want to get the colors at Radhanagar Beach, you have to go early the morning. The catch, however, is that it does not provide any view of the sunrise, which many photographers are eager to shoot, and is quite stunning at Beach #5. See this sunrise and I think you'll agree. Chidiya Tapu, also known as "Sunset Point" and "Bird Island," is one of the best places to see the sunset after flying into Port Blair, the main hub of the Andaman Islands. The beach is located on the furthest Southern tip of South Andaman Island 25 kms South of Port Blair and takes about 45 minutes to get there by car (or over an hour by bus). The road traverses through dense jungle/rainforest that opens up along the coastline in a few places. There are "beware of crocodile" signs along the way, and the sign on the beach at Chidiya Tapu reads "Beware: Crocodile Infested Beach." We didn't see any crocodile during our three days in the Andamans, and no one we met had seen one either, although our drivers said they do see crocodiles every now and then. 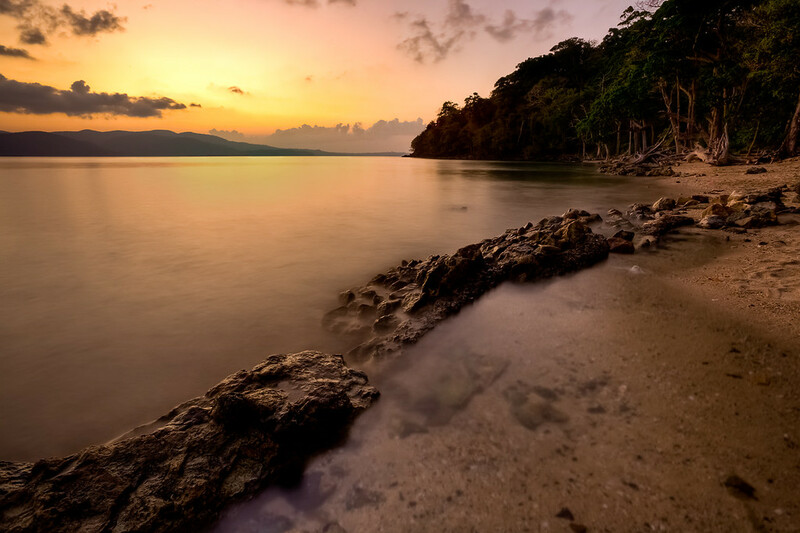 While Chidiya Tapu is probably the best sunset spot accessible from Port Blair, the horizon is obstructed by the hills of Rutland Island across the bay. 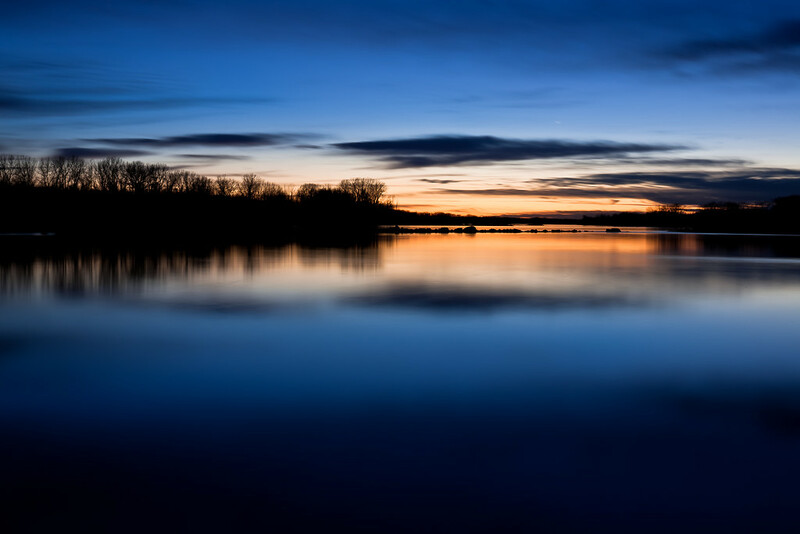 As a result, the best colors come out about 30 to 45 minutes after the sun dips below the hilly horizon. This is a six exposure HDR and these were the last six shots I took before heading back to Port Blair. The exposures range from one second to 30 seconds in one stop increments. 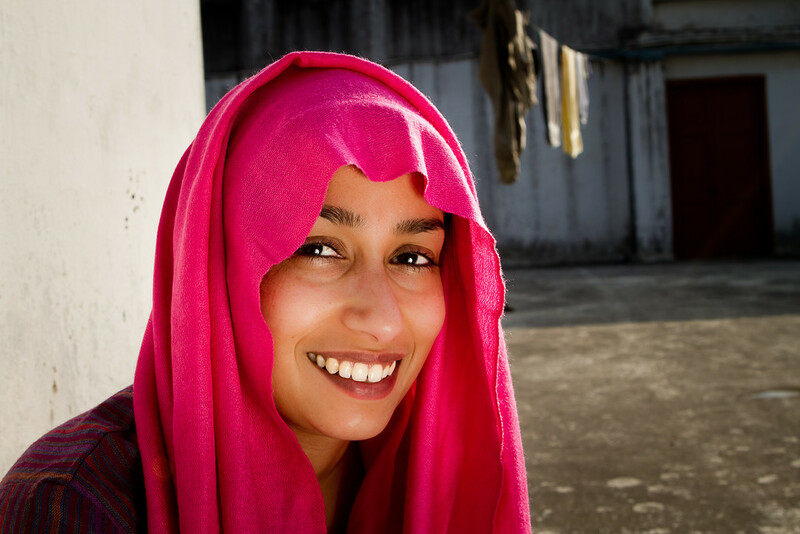 My favorite photo from our recent trip to India. This one makes all of the gear and time spent studying portraiture worth while. This is Nini's grandmother Dadi, and she is too amazing for words. 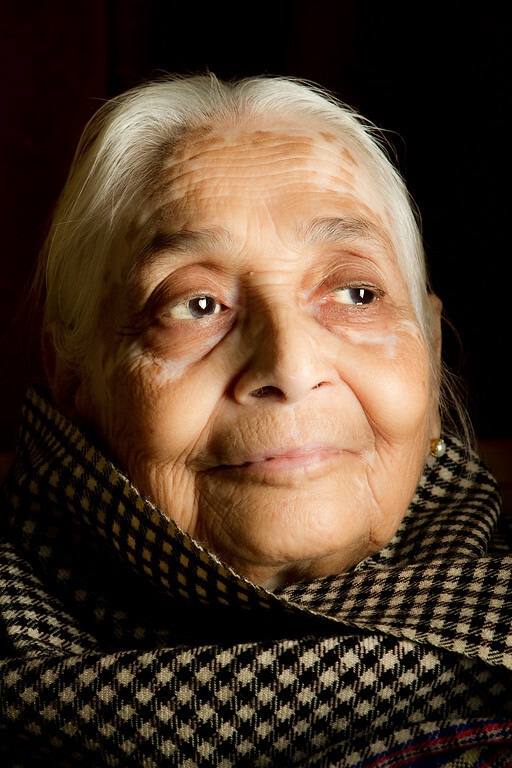 I'm so happy to have a few good photos of Dadi in my collection now, some from this trip and some from when she visited the states in the fall of 2010. To me this photo is priceless, and I would gladly pay any price for a photo of my own grandmother just like this one. I used one light for this portrait, a speedlite in a softbox in front of Dadi and to the camera right, lighting Dadi from just short of a 90 degree angle (maybe 80 or 70 degrees). I always start with one light, usually a softbox like this, and then add additional background, hair and fill lights or reflectors. Usually I like the results with one light the best so I make sure to spend a lot of time shooting with one light at the start. 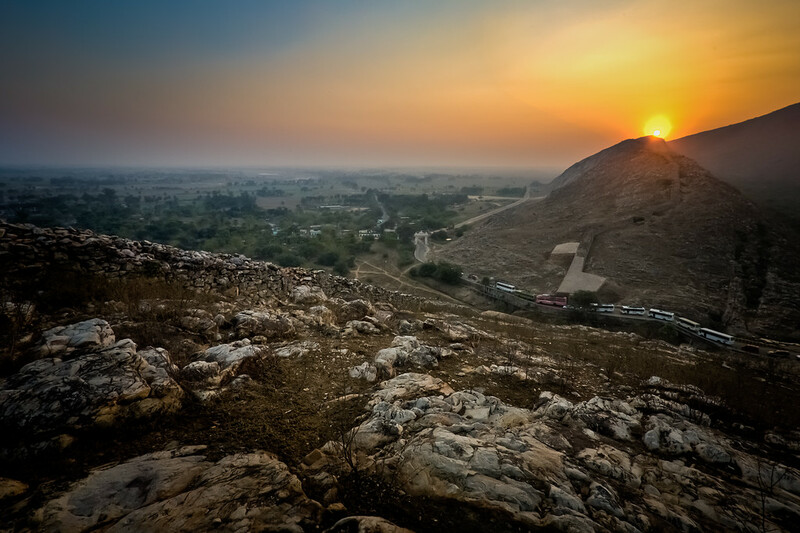 The view from a hilltop in Rajgir, a holy town for Buddhists. We made a quick one night trip to visit Nini's Aunt and Uncle during our trip to India in late December 2011. You can see the row of tour busses carrying mostly Japanese and Korean buddhist travelers. The main road was completely swamped with people wanting to see the holy hot springs where Buddha himself once bathed. I much preferred the view from the hills and the fertile valleys beyond. It was amazing that in one minute I was on the road below, stuck in a traffic jam and breathing fumes with thousands of others, and 10 minutes later I was on top of the hill, all alone, taking in this beautiful view. Everyone was amazed that I could run up the hill so fast! I was amazed no one else wanted to do the same! 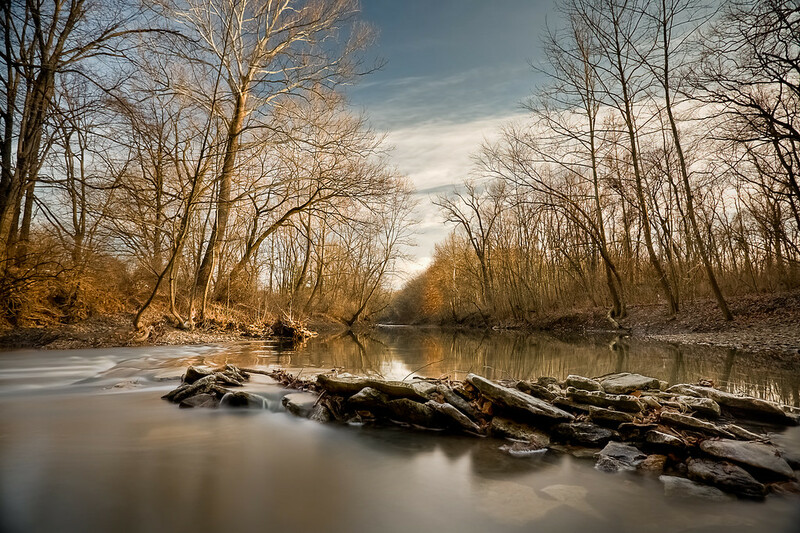 The golden morning light diffusing down through the trees and reflecting on Hinkson Creek. Grindstone Nature Area is full of beauty. This was about an hour after watching an awesome sunrise with Big Red on the cliffs.